This was absolutely delicious. It also felt really healthy. I didn't bother putting it in the oven and served it over spinach and then drizzled the sauce over the top. Slice 4 of the aubergines lengthways in 4 thick slices. Season with salt and pepper. Place the remaining one on an open flame to char the outside skin, turning regularly. Once ready, the aubergine should feel soft when you stick a knife into it. Once cool enough to handle, cut in two and spoon out the flesh. Place the flesh in a blender with the molasses, garlic, cheese and 50ml of olive oil. Process until smooth. In an open pan, reduce the tinned tomatoes until you obtain a thick “dryish” sauce. Then, add the aubergine purée, mix well, taste for seasoning and keep aside. Pat dry the sliced aubergine, drizzle some olive oil over and grill on a cast-iron griddle or on the BBQ. Make the green sauce by blending all of the ingredients together in a processor until smooth. Taste for seasoning. 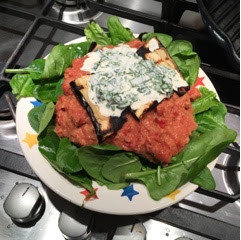 Place 4 of the outside slices of aubergine on an oven dish then spoon some tomato and aubergine sauce over. Top with an inside slice and repeat the operation, finishing with an outside slice. Place in a hot oven for a couple of minutes. Pour some of the green sauce onto 4 plates, place the hot aubergine stack next to it, drizzle over some olive oil and serve.